The last thing the world needs is another blog. I get that. But this blog is less about changing the world and more about changing me. You see, I’ve got words. And I’ve got passion. And I used to think that meant I had something to say. Sharing all my words ended up hurting me and, worse, hurting others. So I closed up shop and basically stopped writing for a couple of years. Now, I’m learning that the answer lies somewhere in the middle of the two extremes. I’m learning that the words that deserve to be shared are the ones that keep bringing themselves back into my mind for days…or weeks…or months…until they’re planted in my heart. These are the words that deserve air time. Words that will build up broken spirits, pry open closed hearts, and infuse love into hopeless situations are words that have earned their right to be shared. I’m scared to death that I’ll get it wrong. Scared to death that I haven’t actually learned anything and that this space will turn into something almost but not quite what it was meant to be. Those are the thoughts that have kept me quiet for the past year, long after my heart had regained its desire to share. Now, it’s time for me to silence those fears. So today, I’m saying No. No, I will not be frightened of failure. No, I will not be discouraged by my inadequacies. No, I will not remain silent. I’m saying No, so that I can say Yes. Yes, I will try again. Yes, I will trust God to guide me. Yes, I will speak life. What’s your Yes? 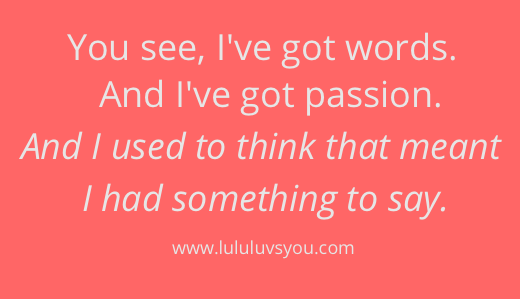 Is there something you’re avoiding because you’re scared, intimidated, or nervous? I believe you’re capable of more than you think, and I’d love to encourage you to believe that, as well. Why doesn’t He do that anymore? Is He asleep? I never doubted God’s existence, but I sure did wonder what He was up to most of the time. Where are you, God? How is this happening on your watch?? It wasn’t long before God started to answer my questions. “I began to cry and couldn’t stop. I wanted to shut it all out. I was angry with God. Where are you? How can you allow so much suffering? What has come out of that obedience is miraculous. Kristen, her husband, Terrell, and their close friend Maureen founded a maternity home to rescue pregnant girls from the worst slum in Kenya. They named it The Mercy House. The Mercy House is a miracle. The fact that it even exists is amazing, but the work that is being performed in the hearts and minds of the girls who have found solace within its walls is incredible beyond description. Everytime I read a new sponsor update or see a new video posted on the Facebook page, I am amazed. I no longer question God’s whereabouts or wonder if he’s sleeping. I have been an eye-witness to a miracle, and I will never be the same. 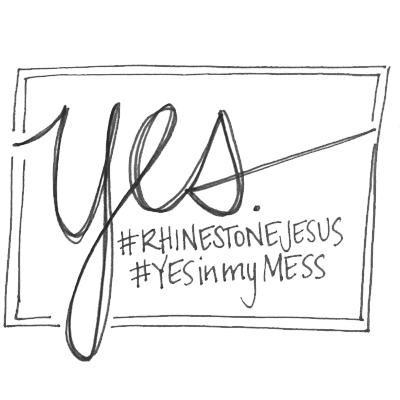 It’s easy to look at something as big and miraculous as The Mercy House and think, “I could never do that.” But in Rhinestone Jesus, Kristen reminds us that nobody can and everybody does. Miracles are made in the midst of the messes: Broken promises. Troubled relationships. Hopeless situations. And they almost always begin with Yes. No problem is too big. No yes is too small. 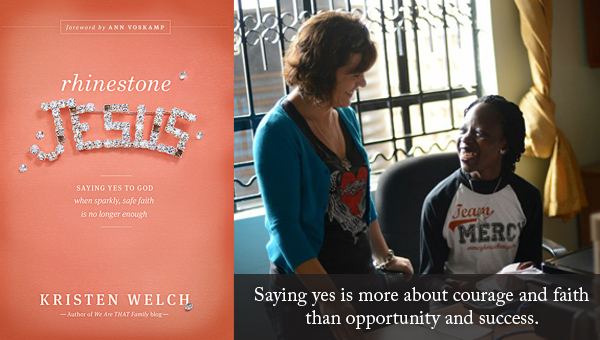 Behind the scenes of every miracle, you’ll find a person who was willing to say Yes right in the middle of their mess. I was thrilled when my copy of Rhinestone Jesus arrived on my doorstep. I was encouraged by the very real story of Kristen’s journey. I was amused by some of our similarities and challenged by some of her questions. Today, I’m equally thrilled to be offering you a chance to find Rhinestone Jesus on your doorstep! I’m excited for you to be encouraged, amused, and challenged by Kristen’s story. I believe that you’ll find your own yes right in the middle of Kristen’s, and I can’t wait to hear all about it. 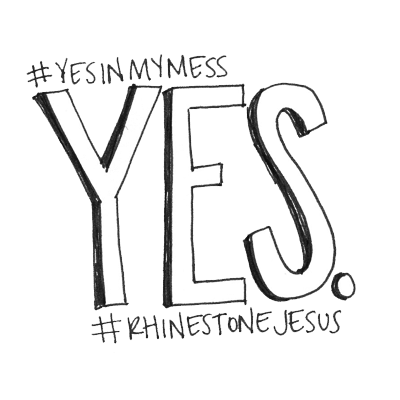 Today, I’m giving away two copies of Rhinestone Jesus. To enter the giveaway, simply leave a comment to let me know you’d like to be a part of the contest. The giveaway will close at midnight on Wednesday, April 30th, and the winners will be announced on Thursday, May 1st. Thanks for stopping by!